Leading Manufacturer and Exporter of Brass Nameplates such as Deep Etched Brass Nameplate and Raised Etched Brass Nameplate from Pune. We are engaged in presenting Deep Etched Brass Nameplate. 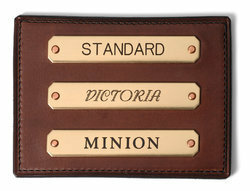 The offered range of name plates is designed in multiple colors and has varied etch depth. These brass nameplates are made available in different sizes and shapes and are widely appreciated for their extreme durability, stylish designs and finish. Offered nameplates are best to be used on the exteriors and our clients can avail these nameplates at affordable rates. We are one of the leading manufacturers, suppliers, and exporters of Raised Etched Brass Nameplate, which is etched to specific depth and then the letters and border are raised up to a certain extent. We polish these plates so that they can sustain for a long time. Offered nameplates can be decorated on both sides for items such as valve tags, and can have multiple colors etched and paint filled onto them. Our company is into manufacturing, exporting and supplying a wide range of high quality Brass Nameplates. These products are widely used as nameplates at homes and offices, owing to their fine finish, smooth surface, dimensional accuracy, and elegant looks. Furthermore, our products undergo various quality assurance tests, to ensure high standards of quality. 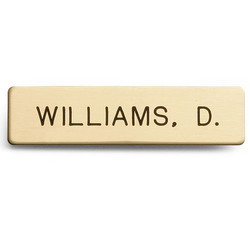 Looking for Brass Nameplates ?